It has only been in recent years that a message of embracing and talking about our failure has been part of a public conversation among arts and cultural organizations. I am not sure how many people are including these stories in their reports to funders, but little by little people are willing to admit that not everything has gone has planned. Still, we don’t see a lot of articles and case studies where people are analyzing where they went wrong. It was for that reason that Madhavan Pillai’s account in Arts Management Quarterly drew my attention. Pillai had experienced great success with a walking project which drew attention to the polluted ecosystem along the Cooum River near Chennai, India. Buoyed by this success, he wanted to create an arts festival along the river to inspire people to take ownership in the well-being of the river. The overemphasis on democratic leadership, which is otherwise considered to be a best practice, turned around to become disastrous…During the high-point of crisis I was consulting team members and addressing everyone’s concerns….A consent with all members could never be reached. The mode of action instead geared towards an apologetic atmosphere with self-satisfied and settling egos within the team. Based on this experience, I think that leadership should be trained to face failure as the most powerful source for know-how and understanding. It teaches survival, renewal and reinvention of yourself and the organization you are leading, but this learning about failure should be built in education. If the control over the team and partners is not strong, the leadership is forced to accept new ideas that emerge every day. The lack of factoring the failure left no room to fight the crisis and I was left alone with unnerving thoughts, waiting for a miracle to happen. Irrational and persistent fear of failing kept me towards pushing my limits and digging inside to explore….As the famous proverb goes “success has hundred fathers, failure is an orphan”, I was abandoned. A lot of interesting thoughts here. In addition to the text I bolded regarding how experiencing failure makes you stronger, Pillali’s mention of being paralyzed by fear and waiting for a miracle were not unfamiliar. I have seen a good number of arts and cultural organizations where miracle seeking in the face of a paralyzing crisis has been the default mode of operation. I have felt fortunate that I was not on the inside of those organizations because I have had the unfortunate experience of being on the inside of organizations that operated in this way. Four years ago I wrote about a coalition of performing arts organizations in upstate NY that was fighting to mitigate the impact of having new casino projects compete with them for performing arts talent. As I had written, what often happens is that a casino is in a position of offer a lot more money to artists thanks to their revenues from gambling and hospitality. So an artist you could contract for $25,000 for a single performance can now get $40,000 a night for a week at a nearby casino. Even if the artist might be willing to accept a lower fee at your venue, exclusivity clauses in their contract may prohibit them from performing in a 50-75 miles radius 90 days prior and 60 days after their casino engagement. When I wrote that post four years ago, a commenter asked that I keep up on the efforts of the performing arts organizations, Coalition for Fair Game and update readers. I have been thinking I needed to circle back to the story and write another post. The topic got brought to the top of my attention today at a meeting of Georgia performing arts presenters where a group that has been lobbying legislators on this issue gave a report on their efforts. One of the things I did not realize is that many states are requiring that casinos earn a certain portion of their income from non-gambling sources like entertainment and hospitality. To some degree then, casinos are being forced to move into competition with non-profit performing arts organizations. The guy reporting on the lobbying efforts said until they started talking with lawmakers about the repercussions of this requirement, it never occurred to the government officials that these requirements would have a negative impact on arts organizations locally and statewide. So if your state is starting to look to legalize gambling or increase the presence of large casino complexes, it may behoove you to start conversations with lawmakers about the implications of these decisions. As the discussion of the problem and lobbying efforts was occurring, I did a quick online search to learn more about what might have happened in upstate NY over the last few years. It just so happens, a newspaper wrote a pretty detailed story on the subject last month. According to the Poughkeepsie Journal, the Coalition for Fair Game has received $500,000/year to help offset the impact of the casinos’ entertainment operations. The money is designed to offset any negative economic impact that the casino’s headlining entertainment could have on the Bardavon and Bethel Woods. Resorts World Catskills allocates the funding to the theater coalition, which emerged in 2013 and includes venues from Albany to Elmira. Similar deals are in place elsewhere in the state and can be found in Massachusetts. In addition to the cash, this deal gives the Bardavon and Bethel Woods a say in the size, scope and number of entertainment offerings at Resorts World Catskills. The agreement and the casino licenses last 10 years and the payment from the casinos to the coalition is not affected by any fluctuations in gambling revenue. Armed with the knowledge that the arrangement in upstate NY was working, I asked the speakers if they were aware of this arrangement and if they contemplated creating a similar situation if legislation went forward to authorize construction of proposed casinos. They were aware of the arrangement in NY, but said while it was by far the best arrangement of its kind in the country, it is still an imperfect situation and that they would endeavor to carve out a better environment for the state. Seems like something to continue to keep an eye on. Are Church Planting Techniques Suited To The Arts? “Launch” is a big word that they use in both worlds. They talk about “launch Sundays” and “launch budgets” in church planting. And the framing of what they’re doing is in business terms, right? So a lot of the startup capital comes from the biggest denominations. The Southern Baptists– they spend tens of millions of dollars a year on church planting. But a lot of church plants actually get their funding directly from megachurches– established churches that have thousands of members. It wasn’t long ago that Nina Simon made a similar point about church planting and the arts on her blog. Perhaps I should have known there would be parallels with the arts because This American Life titled the episode, “If You Build It, Will They Come?” evoking the “Field of Dreams” mentality we have been urged to abandon. However, what I really found fascinating was the parallels between the problems one church planter had with diversifying the demographics of church planting and those of arts organizations trying to do the same thing with their program participants. This American Life (TAL) spoke to Watson Jones III who became really excited by the church planting model, but noticed that pretty much everyone at this church planting conferences was Caucasian. The TAL reporters confirmed that most church planting happens in gentrifying or affluent urban neighborhoods or suburbs. Jones felt things were wide open for planting churches in urban neighborhoods for people of color. As I referenced before, there is some surprising infrastructure for church planters. Jones got training in budgeting, fundraising, creating a business plan and mission statement for his church, plus an 18 month residency at a church plant site. He ended up landing about $100,000/year funding for three years to support his planting efforts. They ended up doing a lot of things arts organizations do when trying to attract new audiences– handing out flyers and candy on the streets trying to get people to attend gatherings at homes, coffee houses and other non-traditional venues. While the non-traditional worship services at funky, cool locations are pretty much the core identity of the church planting process that helps attract new members, it had the opposite effect for communities of color. ….And one lady told me– she said, you guys are a cult. You call me when you get a church. Especially, I think, among black people, the more out of the box or avant garde you are, the less likely you are to be trusted. Yeah. I mean, we were going to be the people who were out there on the streets, pastors who were very much present with the people. And that’s how we’ll grow the church. That didn’t work. As I am listening to all this, I can’t but help think about how this is literally out of Nina Simon’s TEDx Talk on the Art of Relevance. Nina uses this picture to discuss how some people will see this as a welcoming place and others will see it as scary. 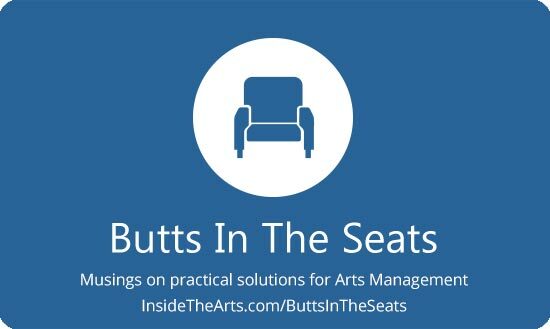 This podcast provides many things to think about regarding the efforts of arts organizations to diversify the groups they serve. The foremost of which may be whether the design and execution of impromptu experiences in non-traditional spaces reflect affluent Caucasian ideals about what outreach efforts to those underserved by the arts looks like and subsequently serve to largely appeal to a similar demographic. Copyright may seem like a pretty dry subject, but the court cases that lead to the development of the law and theory surrounding copyright law can be pretty interesting. HowlRound posted the transcript of Michael Lueger’s podcast discussion with Dr. Derek Miller about some of the early copyright cases that applied to theater and music performance. One of the interesting cases they discuss is competing expressions of the iconic melodrama train track scene where someone escapes just as the train arrives. Apparently playwright Augustin Daly was the first to write such a scene and playwright Dion Boucicault copied the idea. The courts ruled in favor of Daly saying that even though every other element of Boucicault’s play was different, the common action was key to the drama and thus was protected. This general concept holds to today where you can copyright the expression of the idea, but not the name or the idea itself. You can, of course, trademark names and patent effects, but those are different types of protections than copyright. However, the courts say since Jones was working for a Mr. Pelby when he wrote the play, Pelby had the right to sell the performance rights to Thorne. I’ve got a lot of evidence here from the New York Herald, which goes all in for Thorne, and they argue that by trying to shut down Thorne’s production, Jones and Hamblin of the Bowery Theatre are limiting the audience’s ability to compare the artistic products at the Chatham and the Bowery. It’s sort of a free trade argument that they’re making. In other words, according to Thorne and to the Herald … Thorne actually writes an editorial that appears in the Herald … if the productions are allowed to compete with each other, both theatres are going to do even better artistic work than they would otherwise. They say Hamblin is trying to shut down artistic competition and to give you a bad product, but we’re in favor of a good product and letting Thorne do the play. Legally, actually, the case is sort of a weird, unimportant footnote, in terms of the legal precedent it establishes, but it helped in studying this case to teach me how theatrical copyright battles get both parties thinking about the relationship between a work’s artistic value and its monetary value. It is interesting to me that they get into this argument that having competing versions of the same production going on around the corner from each other is providing people with a choice and opportunity to decide which is the better production. Nowadays, when you try to license performance rights you can run into all sorts of restrictions because a 2000 seat venue 200 miles from you planning to do the same production 12 months after you mount your production in a 200 seat theater. While that is kind of extreme, I think the basic idea that people are willing to pay a lower price for a discount version of the same product and cannibalize your potential audience is a real concern. Even in 1841 when Thorne and Hamblin were butting heads, if people wanted to see a show a significant number would probably accept lower production quality for 25 cents at the Bowery versus paying $1 at the Chatham.